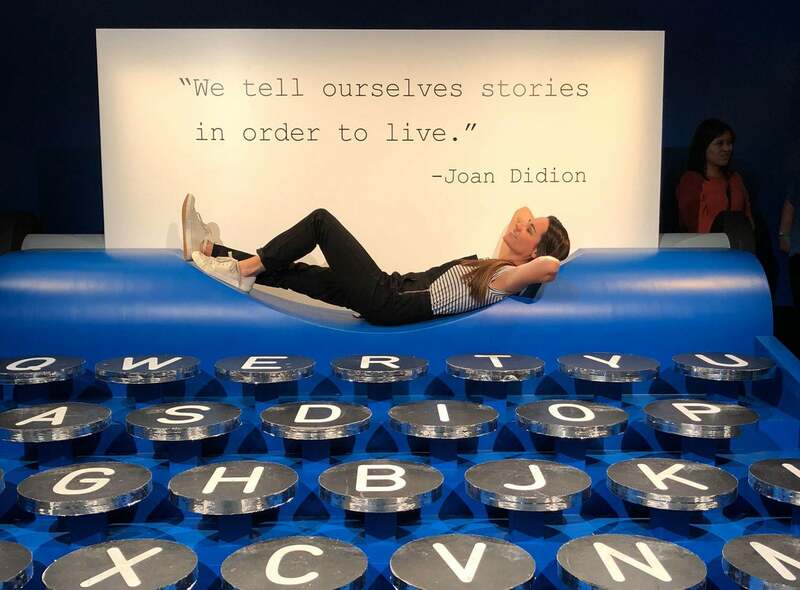 Last week, the Public Relations team took a field trip to Los Angeles to experience Refinery29’s 29Rooms exhibit in real life. We often reference visual experiences like this one (along with Museum of Ice Cream, Color Factory, etc.) as a social trend that resonates with millennials, so when it was announced that 29Rooms would open in LA for a two-weekend exhibition, we snapped up four $19 General Admission tickets before they sold out. The overarching theme was “Turn It Into Art”, which is quite apparent from the moment you step inside. The exhibit is billed as an “interactive funhouse of style, culture & technology, brought to life by a group of global artists and visionaries across mediums, and powered by you.” It is compiled of 29 individually curated rooms that are meant to educate and inspire guests, while at times it can lead to sensory overload. Selfie Currency is a Thing – Everywhere we looked, there was a selfie to be taken. We noticed tons of people using 29Rooms as a prime opportunity to capture social content (and lots of it). We even noticed people removing articles of clothes and changing their outfit as the day continued – you can’t post TOO many images in the same exact outfit. That being said, exhibits like 29Rooms seem like they purely exist to quench the needs for influencers and aspiring content creators. Art is Relative – Some of the rooms were truly outstanding. Our favorites included a speakeasy-style saloon where songstress and poet Darby Anne Walker interpreted and sung your dreams; a Womb Room where you were gently meditated to a peaceful state by poet and social media star Cleo Wade; and the Silent Disco where you can dance to the beat of your own drum listening to Lizzo via wireless headphones in a room filled with twirling disco balls. But a lot of the rooms were merely promotions for brands, ticking off a box on their quarterly marketing deliverables checklist. Sit inside a new Toyota Corolla to ‘experience’ how this car can change your perspective – isn’t that the same thing as looking at a car in a showroom? Or immerse yourself in a land of daisies, only to learn that it is sponsored by Marc Jacob’s perfume of the same name. No thanks. Interactive Funhouses Are For Everyone – Perhaps the fact that 29Rooms was hosted in LA helped, but there was a surprising level of diversity among the people who visited the exhibit. I assumed it would exclusively be a 25-and-under crowd, but there were people of all ages, genders and races enjoying the exhibit. I especially loved seeing mothers and millennial daughters doing the activations together. Activism Is Still Mainstream – There were several rooms tied to activism and cause-related issues, whether it be women’s rights or race/gender equality. 2017 turned out to be a year that deeply divided our nation, but connecting opposing views and shedding light on issues through art and creativity continues to thrive in a big way. While we strongly support the intention of 29Rooms to create inspiration through art, we felt that some rooms, especially the overtly branded experiences, struggled to resonate with this mission. We look forward to future iterations of 29Rooms, especially as it is hosted in more cities across the country, and hope the true focus returns back to the origin of the exhibit: providing a much-needed spotlight on young, emerging artists and designers.